Fret no more, my sweet Southerners (at heart, even). It’s time. 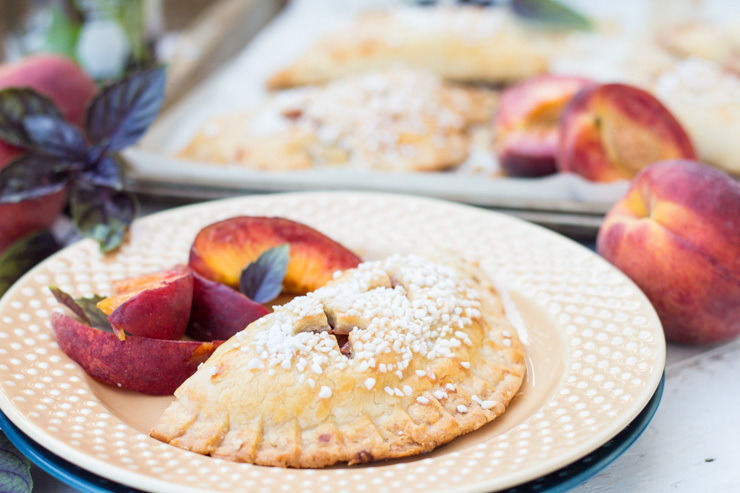 To break in the peak, I present to you– Peach Purple Basil Hand Pies. Now… Y’all already probably can assume my feelings on sugared, buttered, peach-filled pies that you could literally take anywhere. There’s just nothing like a good ol’ stick o’ butter in the morning, right?! I’m pretty sure that it gets your heart pumping. That has to be a good thing. Peaches. 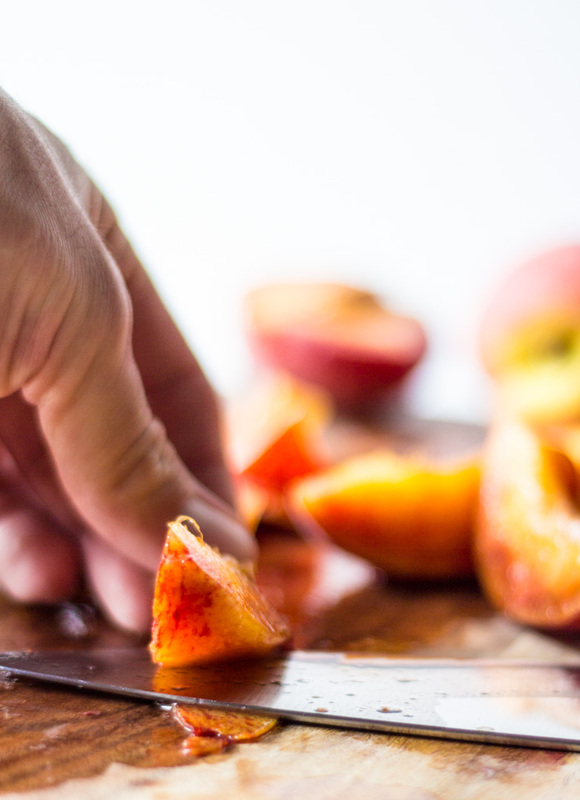 Millions of peaches…. I recently drove to the back of a hidden warehouse in Nashville to acquire a large box of Fiesta Gem peaches from a friend that helps run a super-famous local business, The Peach Truck. These guys bring super fresh Georgia goods from across the border, just a couple hours down the road, straight to eager Nashville hands. When I say I got some peaches, I’m talking like 30 freakin’ pounds. Instead of grabbing a few pounds like a normal person may, I just went ahead and put all of my cards in. Why not? Now that we have described what sounds like a massive drug deal… Back to the pie. 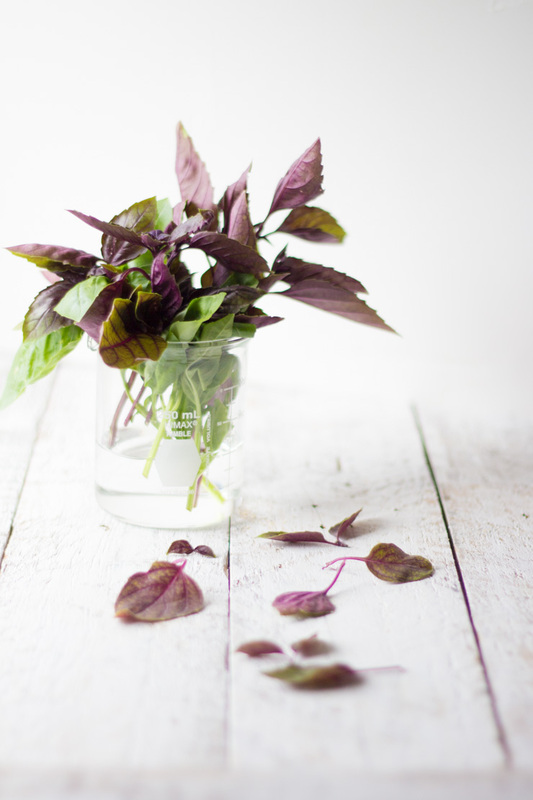 Purple basil is a great choice for a slightly different essence in your bakes. I don’t want to say it has a slight licorice flavor, because everyone knows that licorice is absolutely disgusting. Let’s say that it has a bit more.. ehhh… aromatic flavor. Almost floral-like when baked. It gives you that expected basil flare while leaving you with a bit of hmmmmmm… in your bite. I’ve been using it for all kinds of things lately. 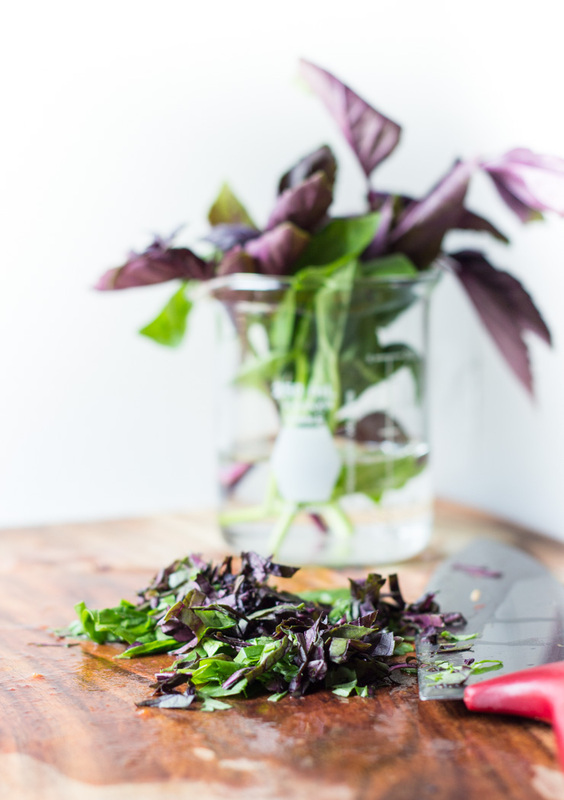 I’ve decided that purple basil pesto will be frozen to pull out this Halloween. The mix in this recipe may sound a tiny bit… unique. 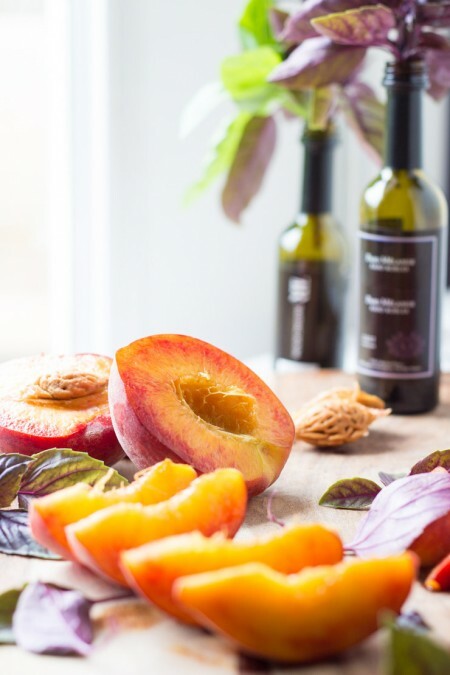 Purple basil, sweet peaches, and some honey. I used a bit of spicy honey for the slightest little sting. Regular ol’ honeybee hooch will work just fine if you don’t have any spicy on hand. I had originally planned on making this into a traditional pie or galette. 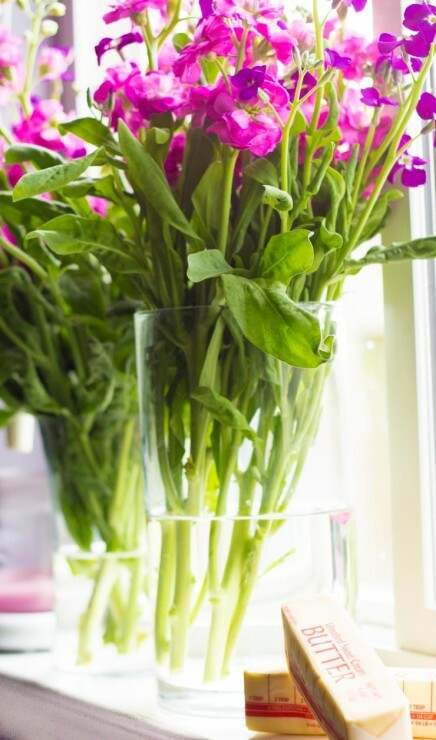 While those are just lovely and all, I started to think a bit. I was about to head out to travel a bit for the weekend… Portable was the answer. Hand pie! 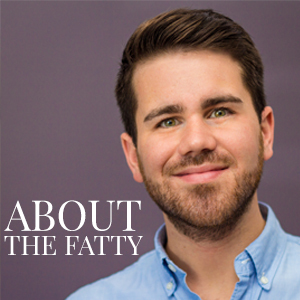 All of you folks out there that are addicted to those icing-glazed 2k calorie pie bombs from he grocery can pull up a chair in the support group. There’s just something perfect about being able to hold a pie in your hand. I cheated on shaping and used one of those fancy-pansy kitchen gadgets, a hand pie crimper. They call is a pocket pie crimper on Amazon… but, ummm, that sounds creepy. I’m not quite sure I ever want to know what a pocket pie is. Crimped and primped, these pups are ready to bake. AFTER you totally cover it with… you got it– pearl sugar! If you follow along here on the blog, you’ll remember that I have had a slight addiction to this crunchy topping of confection perfection for the past few weeks. No shame. Get ya some. Now. Peach Purple Basil Hand Pies from SouthernFATTY.com -- Sugar-coated, sweet, flaky pastry dough wrapped around peach basil goodness. 2 cups sliced peaches, any variety works! In a bowl, whisk together flour, sugar and salt. 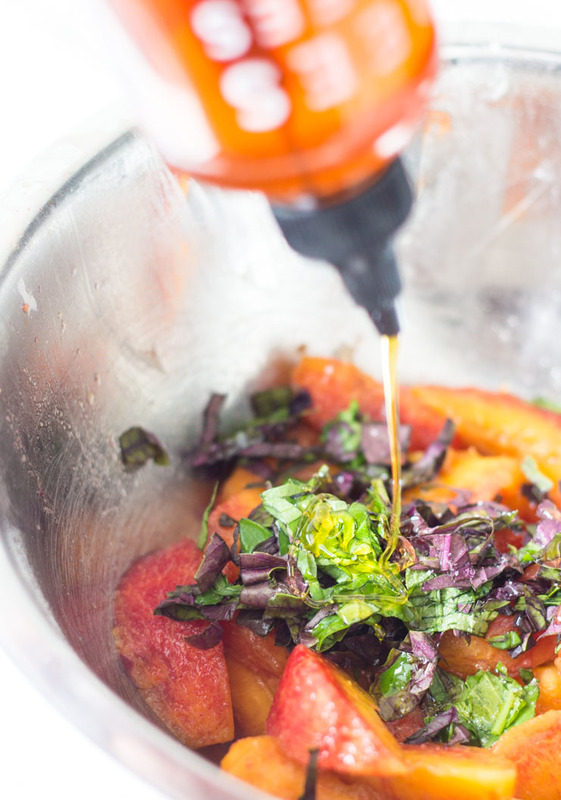 You can use a food processor or mixer or do this by hand. Cut very cold butter into cubes. Add butter to flour mixture and combine very roughly. If using food processor, pulse 5-7 times. If using mixer, mix until it resembles a very coarse blend. By hand, pinch butter with flour. You want butter to clearly be visible in beads in the dough. Add cold ice water and combine softly until just comes together. Split dough in half. Place each ball in plastic wrap and press into a disc. Chill dough for at least an hour or two before continuing with pies. Combine all of the filling ingredients except for the starch into a mixing bowl. Stir well and let sit for 20 minutes. After 20 minutes, pour the liquid into a separate bowl and whisk cornstarch into it well. Return liquid to peaches and combine. Let sit another 10 minutes. During this final rest, remove one disc of the pastry dough from the refrigerator and let rest for a couple minutes to slightly soften. On a lightly floured surface, roll out the first disc into a rectangle, about ⅛-1/4" thickness. If using a pie crimp tool, cut a circular guide from parchment to use for dough cuts. Otherwise, cut matching sized shapes for pies. Place pie dough circle onto floured crimper (if using), use a finger dipped into water to edge the dough where crimping. 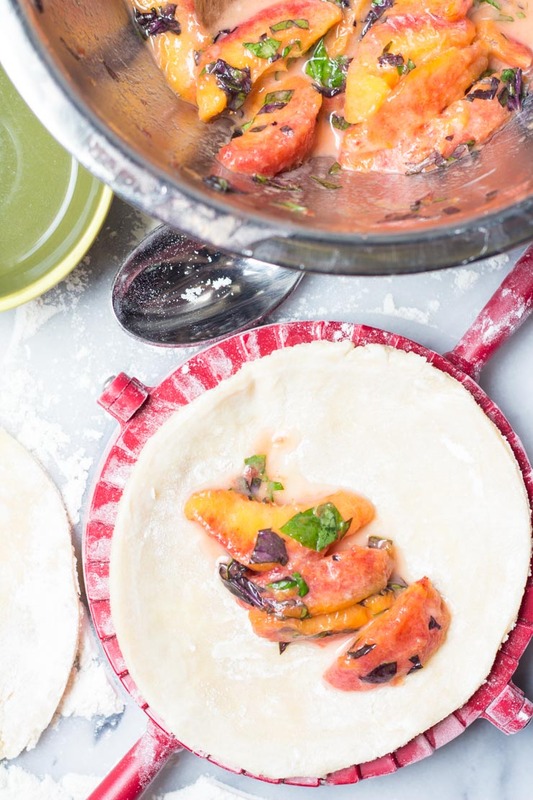 Fill with 1-2 tablespoons of peach filling. Crimp well and transfer pie to a paper-lined baking sheet (with edges, preferably). If not using a hand pie tool, use a fork to seal the half-moon shaped pies shut. Transfer full baking sheet to chill and repeat with second disc of dough. Chill all pies for at least 10-15 minutes before baking. Combine egg and milk/cream. Brush tops of pies with egg wash. Sprinkle pearl sugar to finish. Cut slits into pie tops to allow steam to escape. Bake until golden, about 20 minutes. Coll on racks. Recipe can easily be split in half. Follow along and say hello on Instagram for lots of other eye candy. Yay! I’m glad I’m not the only one who acquires 30 pounds of peaches like its no big deal. How do you keep them from turning before you get the chance to use them all? I learned that you can make some pretty great jam out of the leftovers (even if they start to get a bit soft… they actually get a bit sweeter that way) that I keep cold. We have those little pie machines, too, but have only ever used them to make potstickers. Why? It’s because we are foolish people. 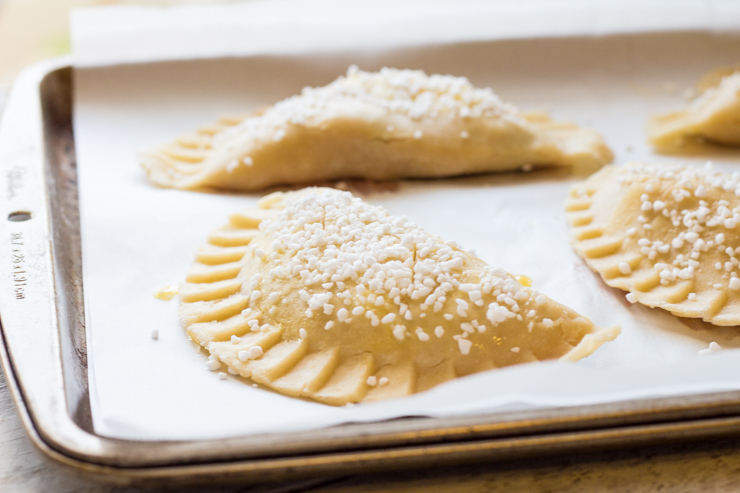 Clearly, peach hand pies are the way to go. Our peach tree is still just a toddler, but I’ll see if I can lay hands on some backyard peaches soon and give these a bash. I even have the pearl sugar in the pantry, so I’m halfway there. I wish I had a little peach tree! Hope you enjoy it when you get your hands on some. I guess your blog for the next few weeks is going to be pretty much the peach one, right? And that’s cool – I have no reason not to love them! 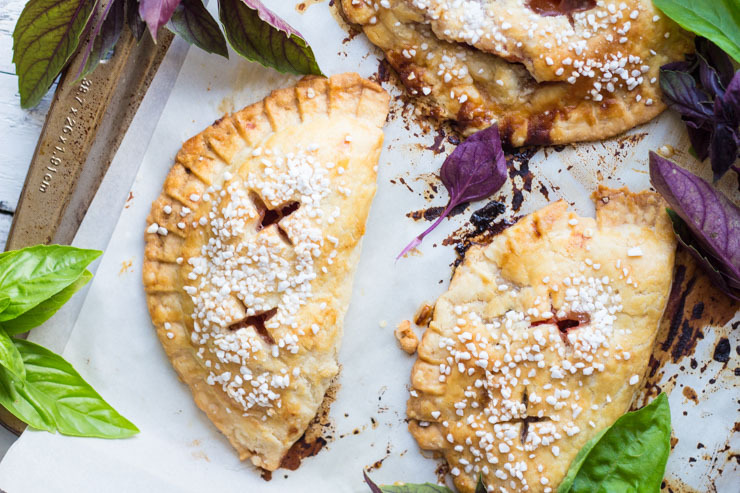 Hand pies are always the best choice because you can eat as many as you want. Who would ever count hand pies? 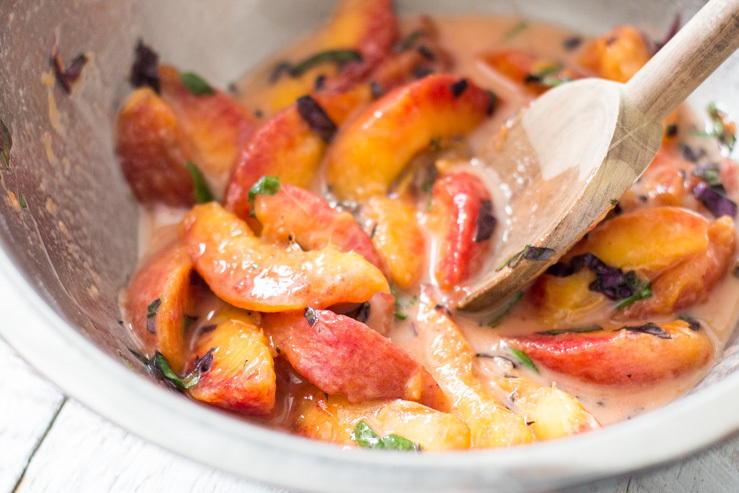 And I’m totally with you on choosing this beautiful combo of peaches and basil. Great job, Phillip! My list of recipe ideas is nearly 20 long currently…. No shame in my peach game!